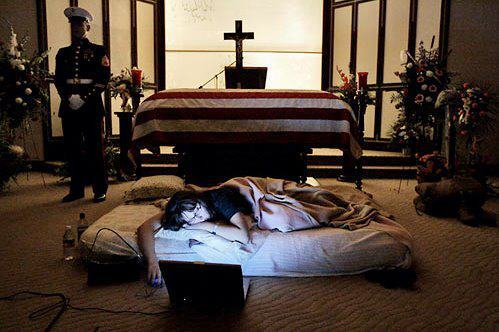 The night before the burial of her husband 2nd Lt. James Cathey of the United States Marine Corps, killed in Iraq, Katherine Cathey refused to leave the casket, asking to sleep next to his body for the last time. The Marines made a bed for her, tucking in the sheets below the flag. Before she fell asleep, she opened her laptop computer and played songs that reminded her of "Cat", and one of the Marines asked if she wanted them to continue standing watch as she slept. "I think it would be kind of nice if you kept doing it" she said. "I think that's what he would have wanted". Not sure what is more honorable: Being married to this faithful wife to the end or the Marine standing next to the casket watching over them both. beautiful Randy. Thanks for sharing.